NEW YORK — Favorites or underdogs, the Ottawa Senators couldn’t care less what people think of their chances in the Eastern Conference Final. 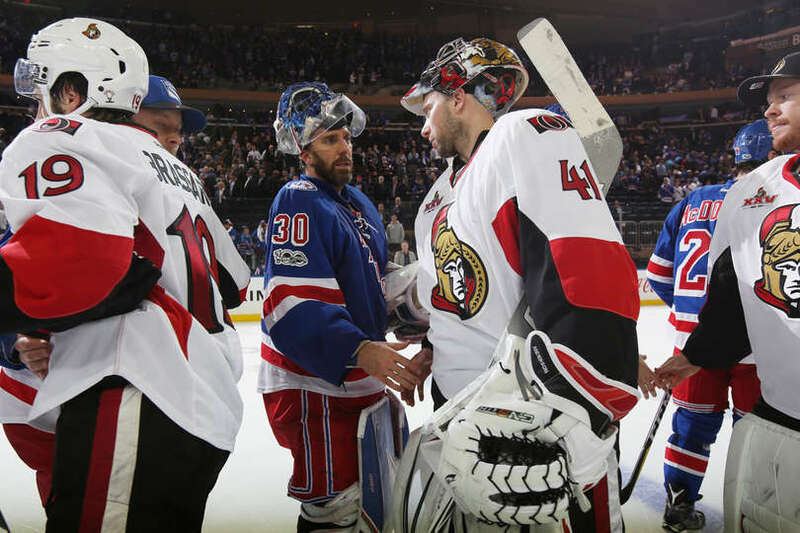 What matters to the Senators is that they will be there following a 4-2 win against the New York Rangers in Game 6 of the Eastern Conference Second Round at Madison Square Garden on Tuesday. Ottawa won the best-of-7 series 4-2. Craig Anderson made 37 saves, and Erik Karlsson had a goal and an assist for the Senators, who will play the Washington Capitals or Pittsburgh Penguins in the conference final; the Capitals host the Penguins in Game 7 of their second-round series on Wednesday. The Senators hadn’t reached the conference final since 2007. Mike Hoffman and Mark Stone scored in the first period, and Jean-Gabriel Pageau had an empty-net goal for Ottawa. Mika Zibanejad and Chris Kreider scored, and Henrik Lundqvist made 22 saves for the Rangers, who were 0-for-4 on the power play. Zibanejad got the Rangers within a goal at 13:32 of the second period when he was sent in on a breakaway after a pass from Mats Zuccarello and beat Anderson with a wrist shot to make it 2-1, but Karlsson restored the two-goal lead at 3-1 2:21 later. Kreider scored 53 seconds into the third period to make it 3-2. Zibanejad’s long pass got between Clarke MacArthur’s skates in the neutral zone and sent Kreider on a breakaway. He beat Anderson with a wrist shot for his third goal of the Stanley Cup Playoffs. Pageau scored with seven seconds left to make it 4-2. Hoffman scored 4:27 into the first period when he redirected Karlsson’s pass past Lundqvist to give the Senators a 1-0 lead. It was the first time in the series the Senators scored first. Stone made it 2-0 when he sent a wrist shot from the left circle past Lundqvist at 14:44. It was his fourth of the playoffs. New York used its coach’s challenge to review whether Kyle Turris was offside prior to Stone’s goal, but the call on the ice was upheld. Anderson made 13 saves in the first period. Karlsson took a backhand pass from Bobby Ryan and beat Lundqvist from the left circle at 15:53 of the second period. Anderson preserved Ottawa’s 3-2 lead when he denied Kreider on a 2-on-1 with Zibanejad by sliding across the crease to get his pad on Kreider’s quick redirection with 14:52 left in the third period. Stone made a move around Rangers defenseman Brendan Smith, only to have Lundqvist poke the puck off his stick. Lundqvist, who was on his back, managed to keep Karlsson’s slap shot out of the net with his glove with 6:49 left in the first period. Senators defenseman Marc Methot had two takeaways, two hits, one blocked shot and was plus-3 in 24:26 of ice time. Karlsson was plus-4 in 28:44. … Ottawa forward Viktor Stalberg left 5:59 into the second period with an undisclosed injury. … The last time the Senators were in the conference final in 2007, they defeated the Buffalo Sabres in five games. Ottawa lost to the Anaheim Ducks in the Cup Final in five. Ottawa also reached the conference final in 2003, when they lost to the New Jersey Devils in seven games. … The home team won the first five games of the series. … Lundqvist won 10 of the previous 11 home games when the Rangers faced elimination.